Oh, what I hath wrought to the world. As readers of my critical review of Lisa McCubbin’s first of four “co-authored” books The Kennedy Detail well know , I am thoroughly convinced that it was my 22-page letter to Clint Hill in 2005 that awoke a sleeping giant. Hill, then 73 and with zero want or desire to write a book (a sort of badge of honor that he carried for decades), was angered by my letter, a “cliff notes” version of the basics from my then self- published first book critical of the JFK-era Secret Service entitled Survivor’s Guilt.It is important to emphasize the fact that Hill had an unlisted address and phone number at the time; it was only through the good fortune of an unsolicited bit of help via a colleague of Hill’s, former agent Lynn Meredith, that I was able to obtain this then highly-sought bit of information. As I discovered during my June 2005 conversation with Gerald Blaine, Clint shared the contents of my private letter to his fellow former agent, a man who, I soon found out, was his best friend for many years and who was, by any measurable standard, an obscure agent of the Secret Service who was on the Texas trip (but not in Dallas), having served a meager five years with the agency. Perhaps you can figure out where this is headed to. And, yet, as I have written at length about in both my book Survivor’s Guilt, my forthcoming book The Not So Secret Service, and in several CTKA reviews (not to mention countless blogs and posts online), her work cannot be trusted with anything controversial. Sure, you can take it to the bank when she writes about harmless historical items such as Hill’s many interactions with Jackie Kennedy and other Redbook/Reader’s Digest type moments, but her work should be viewed with a jaundiced eye when the Kennedy assassination is mentioned. Hill, Blaine and McCubbin are much aware of my work; no delusions of grandeur here. Apart from my aforementioned 22-page letter that opened Pandora’s box, Hill and Blaine have discussed my work on C-SPAN with CEO Brian Lamb (in Hill’s case, twice); Blaine sarcastically names me as a Secret Service “expert” on pages 359-360 of his book (and quite a few other pages are a direct response to my work); I am credited at the end of a 2013 television program in which Hill briefly addresses my “allegations” (McCubbin also participated as well); Blaine had his attorney send me a threatening letter; McCubbin, who contacted me about my blog, gave my first book a one star on "Good Reads" and has even admitted on C-SPAN of finding information that contradicted Blaine (almost certainly my work); Blaine added my book as an item “to read” on "Good Reads"; Blaine and Hill friend (and former agent) Chuck Zboril, much aware of my blog, gave my first book a one-star review on Amazon; former agent Ron Pontius mentions one of my articles without naming me on the television documentary; and I have been treated to petty harassment by several other personal friends of Blaine, both at home and at my former place of employment. With all of this in proper focus, it is time to examine the latest offering from the Hill/McCubbin partnership, Five Presidents. While serving five different presidents is somewhat noteworthy, Hill is hardly the first or only one to have served five or more presidents or to have written books about their service. SAIC Edmund Starling (author of the 1946 book Starling of the White House), SAIC/ Assistant Director Rufus Youngblood (author of the 1973 book Twenty Years in the Secret Service: My Life With Five Presidents), Chief/Director (and former SAIC) James Rowley, SAIC Gerald Behn, ASAIC Floyd Boring (who contributed to David McCullough’s 1993 book Truman and the 2005 Stephen Hunter book American Gunfight), ASAIC Roy Kellerman, Art Godfrey, Chuck Zboril (misspelled “Zobril” on page 451), Winston Lawson, Emory Roberts, Vince Mroz, Howard Anderson, Morgan Gies, SAIC of PRS Bob Bouck, John Campion, Ron Pontius, Stu Stout, Hill’s brother-in-law David Grant, Director Stu Knight, and others served five or more presidents (the number is quite large if one were to include agents from field offices and/or on temporary assignments, as it was not unusual for an agent from the FDR-Ike era to serve for many years on the White House detail, later known as the Presidential Protective Division, or in the Washington field office, among many other field offices around the country and, indeed, the world. The number is even larger if one was also to include those agents who also protected former presidents or vice presidents who later became president such as Truman, Nixon, LBJ, Ford, and Bush 41). Part 1 of the book, encompassing the first seven chapters, details Hill’s time protecting President Eisenhower. After learning that Hill served in Army Counter Intelligence from 1954-1956 (pages 8-10), serving duty at Fort Holabird (where Richard Case Nagell and fellow agent Win Lawson also served), Hill makes a troubling error, claiming that James Rowley was the Special Agent in Charge of the White House detail since the FDR days (page 14) when, in actual fact, he became SAIC on 5/3/46 during the Truman era, replacing George Drescher. 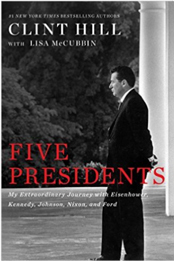 In yet another contradiction to the writing of Gerald Blaine and Lisa McCubbin found on page 398 of The Kennedy Detail, wherein they state that Ike usually rode in a closed car, there are seven photos of Eisenhower in a motorcade and every photo depicts him in an open vehicle. This is in addition to various times in the actual text where Hill mentions Ike riding in an open car (this reviewer has found dozens and dozens more photos online of President Eisenhower in an open-topped vehicle. In fact, one is hard pressed to find any photos of Ike in a closed car). On pages 40 and 46, in particular, the heavy use of well-armed military guards on Ike’s foreign trips paints a picture in sharp contrast to Dallas circa 11/22/63. On page 48, there is a minor contradiction: Hill states that Ike’s eleven-nation tour was his first time out of the United States, yet, on page 24, he writes of an earlier one-day trip to Canada with Ike. On pages 53-55, Hill describes working with Harvey Henderson, a controversial and racist agent from Mississippi who harassed fellow agent Abraham Bolden to no end. While Hill describes Henderson as “a good ol’ Southern boy," he was more forthcoming to author Maurice Butler: “Now there were certain individuals in the service, I won’t deny that, who were very, very bigoted. Most of them came from Mississippi or Alabama or somewhere in the South. Sometimes we had problems with them. They didn’t want to work with a black agent.” Fellow agent Walt Coughlin told me, “Harvey Henderson he [Bolden] is probably rite (sic) about.” Yet The Kennedy Detail’s Gerald Blaine, in typical fashion, wrote this reviewer on 6/12/05: “I don’t remember anybody on the detail that was racist. Merit was perceived by a person’s actions, their demeanor, reliability, dependability and professional credibility – not race! Harvey was not even on the shift that Bolden was during his thirty day stay. Even though Harvey Henderson was from Mississippi, I never heard of him discriminating nor demeaning anyone because of race.” Can the reader see why I have major problems with history as seen through the Blaine and McCubbin prism? There’s a real tendency to whitewash and omit crucial information. They know better…and they know I know better, but they are hoping you do not, if that makes any sense. But I digress a tad. Also on page 55, Hill notes that local police helped secure buildings and routes of travel, as well as checking out the local medical facilities (which he further notes on page 81). Yet, again, when President Kennedy goes to Dallas, officially speaking, no buildings were secured, the motorcade route was woefully short staffed, and they allegedly did not know that Parkland Hospital was the closest hospital in case of emergency. Overall, I would assess Part 1 of the book-the Ike era- as a fairly decent perspective of an agent’s time protecting the former World War II hero. Although glimpses of Eisenhower come through, I was left more with Hill’s outlook on trying to do his job than any deep analysis of Ike. Part 2 covers the Kennedy era and encompasses chapters 8-19 and much of it will be familiar to anyone who has read the three previous Lisa McCubbin co-authored books; lots of repetition here. That said, there are some items of interest. On page 112, it is noted that the 27-mile motorcade route in Caracas, Venezuela was massively guarded by the host country’s heavily-armed military, involving more than 30,000 soldiers and 5,000 police officers. The bubbletop was used, despite the nice weather, and agents rode on the rear of the limousine. On page 133, while discussing President Kennedy’s European tour (in an obvious allusion to the upcoming Dallas trip several months later), Hill writes: “There was no way to check every building or every rooftop," yet that is precisely what they were able to do on past trips, at least those involving multi-story buildings. Chapters 16 and 17 (pages 141-160) cover the Texas trip and the assassination. On page 142 McCubbin, as she did with Blaine in The Kennedy Detail and in the prior two books with Hill, mentions once again the alleged “order” from President Kennedy, via Floyd Boring, to not have the agents on the back of the car. I have written at length on this specific topic, as I am extremely skeptical of the veracity and timing of this situation. My first reaction when reading this section was “McCubbin HAD to put that one in there again." On page 152, not realizing the huge contradiction, Hill/ McCubbin write: “I knew the president didn’t want us on the back of the car, but I had a job to do.” Hill jumped off and on the back of the limousine four different times on Main Street. So much for the president’s “order." No other agent attempted to get on the back of the car. Hill deals with the infamous drinking incident at Kirkwood’s the night before JFK’s death in a very dismissive fashion on page 147. Hill was one of nine agents who drank the early morning of the assassination. Hill was also one of the four agents who drank alcohol who would go on to work the follow-up car in Dallas (the others were Paul Landis, Jack Ready and Glen Bennett). On pages 153-154, Hill writes of the shooting sequence and, as he has done in the past (echoing the same thoughts as Dave Powers and Governor Connally on the matter), Hill states that all three shots made their mark and there was no missed shot: the first shot hit JFK, the second hit Connally, and the third was the fatal head shot. Again, he does not realize the grave contradiction to official history. In this regard, he once again repeats what he has written (and said) many times before: JFK had “a gaping hole in the back of his skull” (page 155). Once again, as was noted in their prior works (and as I was the first to note in my own work): ”Normally [SAIC Gerald] Behn would be on the [Texas] trip, but as fate would have it, he had decided to take a few days off-his first vacation in years…” (page 156). “As fate would have it.” huh? Overall, I would assess Part 2 of the book-the Kennedy years- as largely repetitive from his and McCubbin’s past books, which all seem to tout the same recurring agenda in two parts: his adamant stand that there was only one assassin (despite his contradictory views as expressed by his statements about the wounds and the shooting sequence), and that the agents did the best they could, despite their feelings of failure (and making sure to put that false blame-the-victim nugget in there again for good measure). That said, there were some new tidbits of information about prior trips and, to be fair, the Kennedys shine through in a positive way in this section. Part 3, the LBJ section, encompasses chapters 20-29 and is arguably the best part of the book- Hill really captures Johnson and the so-called “Johnson treatment” quite well. Even before the formal Johnson section of the book begins, the JFK section ends with Hill’s auspicious first greeting to LBJ in October 1964 when the President visited Jackie Kennedy in New York. Hill extended his hand to Johnson and said “Hello, Mr. President, I am Agent Clint Hill." LBJ simply ignored him, reached into his back pocket, pulled out a handkerchief, and blew his nose. Hill said the experience, witnessed by the agents of the White House detail who were guarding LBJ, was “humiliating." Another minor error occurs on page 227 when Hill states that the Kennedys visited Mexico in 1961-it was actually 1962, as is correctly noted on page 114. What I think makes the LBJ section such a winner is not just that it is the longest section of the book, but that the “safe” button was switched to off and Hill is telling the true stories with the bark off, so to speak. Hill succeeds the best here when he vividly describes Johnson’s interactions with himself and others, as well as the impromptu nature of the brusque Texan. Like the travels of Ike and JFK, the many travels, domestic and foreign, of Johnson are duly noted and Hill (and McCubbin) do an admirable job describing the interaction the president had with the hosts and with the spectators, as well as with the agents themselves. When the McCubbin “team” (either with Blaine or Hill) aren’t treading into controversial waters, they actually succeed with some well-written stories and presidential anecdotes. Perhaps this is why I liked Mrs. Kennedy and Me the most- other than a couple pages, it was harmless fun about the elegant First Lady and a touch of Camelot, albeit a tad maudlin and trite in places. In this regard, I believe Five Presidents is a very close second to that work, with Five Days In November being disposable and forgettable and The Kennedy Detail as the worst by a country mile for its deceit and deception. In fact, one could argue that Five Presidents, despite the Kennedy-era repetition and one page (page 142, to be exact) of controversy, is the best of the lot, but I digress. What I think makes the LBJ section such a winner is not just that it is the longest section of the book, but that the “safe” button was switched to off and Hill is telling the true stories with the bark off, so to speak. It is actually a shame, for history’s sake, that an agenda pervaded two of the three earlier books (and a very small part of the other two, this one included) because, again, when McCubbin and Hill just tell the tales, I find myself begrudgingly admiring the vivid pictures of the presidents they draw. In hindsight, perhaps it was Blaine as the true culprit in all of this and Hill merely thought it was good to have in-house symmetry when a touch of the blame-the-victim (JFK) mantra was repeated in his books--less readers would be left to wonder why he appeared to disagree with his adamant colleague. Paradoxically, when it comes to Ike, Hill is diametrically opposed to Blaine (the above-mentioned open car versus Blaine’s claim of an Eisenhower preference for a closed car). Funny enough, there is also fodder for the LBJ-did-it crowd on page 235: Hill, describing Johnson’s 1966 trip to Australia, wrote that the president “crouched down in the backseat…it was the only time I ever saw a president duck down in the rear seat of a car to avoid being seen.” Roger Stone and Phil Nelson, take note. On pages 236-237, Hill describes the Melbourne, Australia trip, wherein angry Vietnam War protestors threw balloons filled with paint at the presidential limousine and, by extension, several of the agents surrounding the car. Hill again makes a minor error, stating that agents Rufus Youngblood and Lem Johns rode on the rear of the car when, in actual fact, it was Youngblood and Jerry Kivett, as several clear films and photos of the motorcade incident demonstrate, although Johns was indeed there and was also splattered with paint, albeit in his position walking by the automobile. The travels and tribulations for LBJ continue through 1967 and 1968, as Hill does a good job of documenting the activities of President Johnson in relation to the monumental events of this two-year period. In particular, the assassinations of MLK (pages 278-286) and RFK (287-295), as well as the turbulent 1968 Democratic convention (pages 303-306), are remarkably described in the context of Hill’s and LBJ’s reaction to them. Interestingly, although Hill’s brother-in-law, fellow agent David Grant, is mentioned on one page (page 303), once again, as he did in his previous two books, Hill does not mention their family connection (although Blaine did so in The Kennedy Detail and in a conversation with myself in 2005, although nothing was mentioned when Grant and Hill appeared, separately, on the television documentary of the same name). As I describe in my forthcoming book The Not So Secret Service, I believe there was bad blood between the two near the end of Grant’s life, having something to do with his writing partner, among other things (Grant passed away 12/28/2013). Hill’s wife Gwen is mentioned in his obituary but Clint is not. As mentioned above, Hill is still legally married to Gwen). On page 376, Hill reveals that he was "one of very few people who knew about the [Nixon] taping system, and, as with all types of similar privileged information, it was kept very private, limited to people on a need-to-know basis.” After learning on page 381 that then-Secretary of the Treasury John Connally was instrumental in promoting Hill to his highest position in the Secret Service (the aforementioned Assistant Director of PPD), Hill describes the inner turmoil he felt in having to witness multiple viewings of the Zapruder film of the JFK assassination during Secret Service training classes. On pages 388-391, Hill totally whitewashes the Bob Newbrand-as-informant matter. Agent Newbrand was used as a plant by Nixon and his henchmen to try to obtain information of a derogatory nature against Ted Kennedy. Interestingly, Hill was in contact with Alexander Butterfield and James McCord (and agent Al Wong), principal people in the Watergate mess. While the dismissal of agents Bob Taylor, the SAIC of PPD, and his assistant, Bill Duncan, by the Nixon/ Haldeman gang is relatively old news for those like myself who study these things (page 403), Hill adds that agent Art Godfrey was also a victim of the purge. To my knowledge, there is no evidence that Godfrey, whom I spoke to and corresponded with, was removed by Nixon’s hand (Director Rowley retired in October 1973). While Deputy Directors Rufus Youngblood and Lem Johns were ousted by the Haldeman gang a few years earlier. In fact, Godfrey was a favorite of Nixon, belonged to the February Group (die-hard Nixon loyalists), watched the Grand Prix with Nixon after the president’s fall from grace, and was even asked by Nixon’s best friend Bebe Rebozo to work for him. Further, it is a matter of record that Godfrey retired in 1974, a year after this all took place, as ASAIC of PPD, not from some field office. Godfrey served on PPD protecting Presidents Truman, Ike, JFK, LBJ and Nixon. Needless to say, I am skeptical of Hill’s assertion. Perhaps Hill is simply mistaken. Chapters 37, 38 and the Epilogue contains some fascinating personal details of Hill’s final days as an agent and the troubled aftermath, as Hill has had trouble coping with his failure on 11/22/63. He goes into detail about his appearance on 60 Minutes in November 1975 (which aired the next month). Hill states that Mike Wallace’s interview was the first time, other than his Warren Commission testimony, that he had ever spoken to anyone about the assassination (pages 429 and 430). This is wrong; Hill was interviewed by William Manchester for his massive best-seller The Death of a President (on 11/18/64 and 5/20/65, to be exact). Manchester also talked to The Kennedy Detail’s Gerald Blaine, Gerald Behn, Bill Greer, Roy Kellerman, Lem Johns, and a host of other agents. However, to be fair to Hill, Blaine also denies ever talking to any author (including Manchester) before he wrote his book. In addition, Hill also spoke about the assassination for 60 Minutes once again (November 1993), The History Channel’s The Secret Service (1995; also a home video), The Discovery Channel’s Inside the Secret Service (1995; also a home video), and National Geographic’s Inside The U.S. Secret Service (2004; also a DVD still available). On the second to last page, Hill/McCubbin write: “As with our previous two books , our overriding concern was to present a factual account to preserve history, while also abiding by the Secret Service pledge to be worthy of trust and confidence.” I would say it is the latter part of that statement that has guided McCubbin, Hill and Blaine through all four books. Sometimes to extremes - don’t embarrass the agency (what J. Edgar Hoover would call “the bureau”) and protect reputations as they would protectees. Nevertheless, with all the aforementioned points and previous disclaimers in mind, Five Presidents must be considered a worthy addition to anyone’s library. The first was the worst…they saved the best for last. A mostly repetitive photo book that appears to have been a cash grab for the 50th anniversary. Since this book is basically a shortened version of Mrs. Kennedy and Me with glossy photos, I chose not to formally review it. George Drescher oral history, Herbert Hoover Library. Survivor’s Guilt (2013), pages 174-175, 403, 407-408. Out From The Shadow: The Story of Charles L Gittens Who Broke The Color Barrier In The United States Secret Service by Maurice Butler, KY: Xlibris, 2012, pp. 125-126. Survivor’s Guilt (2013), page 408. See photo in Survivor’s Guilt. See Survivor’s Guilt and my forthcoming book The Not So Secret Service. 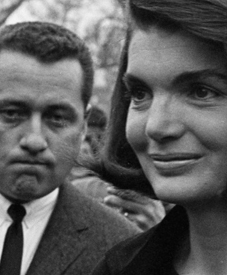 See my CTKA reviews of The Kennedy Detail, the accompanying documentary, and Mrs. Kennedy and Me, as well as my own book Survivor’s Guilt (especially chapter 1) and my upcoming book The Not So Secret Service. See my book Survivor’s Guilt, especially chapters 1 and 10. See my forthcoming book The Not So Secret Service. The Arrogance of Power: The Secret World of Richard Nixon (2000) by Anthony Summers, pages 247 and 262. By definition and book order release, this statement omits The Kennedy Detail.